Improving battery technology and forthcoming regulation of internal combustion engine (ICE) vehicles are boosting the outlook for electric vehicles (EV). EV components offer new opportunities for the aluminium foundries. 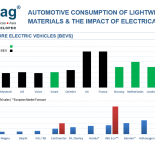 But should the battery electric vehicles (BEV) share rise considerable faster than that of the plug-in-hybrid electric vehicles (PHEV) and full hybrid vehicles (HEV) combined, an overcapacity could hit the aluminium foundries by the end of the next decade. Electric vehicle (EV) battery prices are falling faster than expected and consumer cost of ownership could reach parity with internal combustion engine (ICE) as early as 2018 in Europe [USB]. Forecasts for EVs are revised upwards as its technology is improving promising longer range and shorter charging time in the near future. In the meantime the list of countries imposing regulation or even ban of ICE vehicles is getting longer. The Netherlands and India have just recently announced a complete sales ban of ICE vehicles from 2025 and 2030 respectively, while China and EU have a sales quote system on the agenda for PHEV and BEV. If indeed the next generation of BEVs will have a range of +400 km, charging times of about 15 minutes and cost parity with ICE engines is met due to falling battery prices, the penetration of BEVs will increase rapidly. Looking at the latest projections from 24 different automotive forecasting institutes and tier suppliers a worldwide BEV penetration of 6,86% (range between 2% – 15%) is expected by 2025 growing to 18,56% (range between 5,75% – 34%) in 2030. AluMag Automotive is continuously analyzing the consumption of lightweight materials in automotive applications. Lightweight materials like aluminum, magnesium and carbon fiber are currently in high demand as low weight equals longer range or a reduction of the battery cost for an electric vehicle. 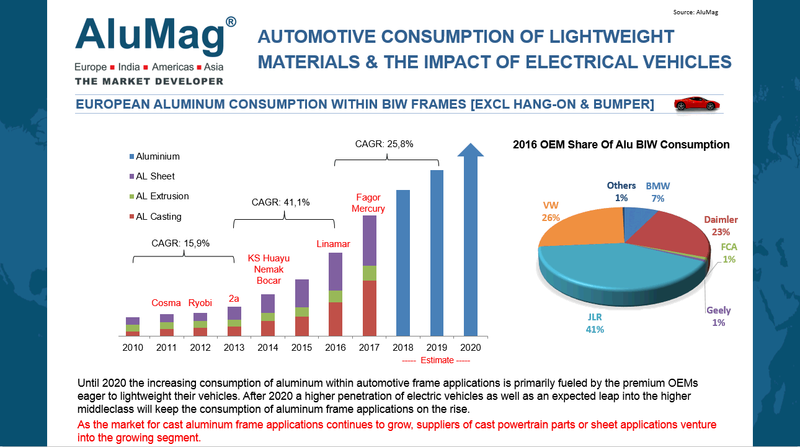 But the fast developing BEV segment could lead to an overcapacity in the aluminum casting industry around 2025 – 2030. Especially foundries (casting entities) serving the powertrain segment together with peripheral components such as pump housings are in the danger zone. 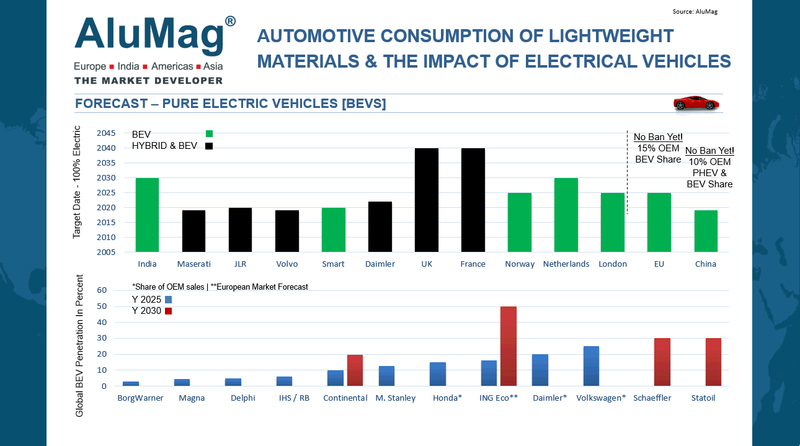 To cope with the additional demand for HEV & PHEV cast aluminium components, capacity has and is being added by the foundries, as well as by screw, hose and pipe manufacturers, some of which will become redundant as the BEV share increases. BEV vehicles contain much less cast aluminium in the powertrain area compared to ICE, HEV and PHEV vehicles. Engine components like cylinder block/ head, oilpan, turbochargers, manifolds to name a few are not needed on a BEV vehicles. And though BEVs features cast aluminium intensive powertrain applications too (motor housing, inverter, converter, charger and stator housing, etc.) they are expected to shed around 35-40kg of cast aluminium within the powertrain area compared to the average Northern American ICE vehicle. Somewhat less compared to European ICE vehicles. For PHEVs the difference in cast aluminium powertrain utilization is even higher considering PHEV applications like electric motor, battery and power electronic housings. 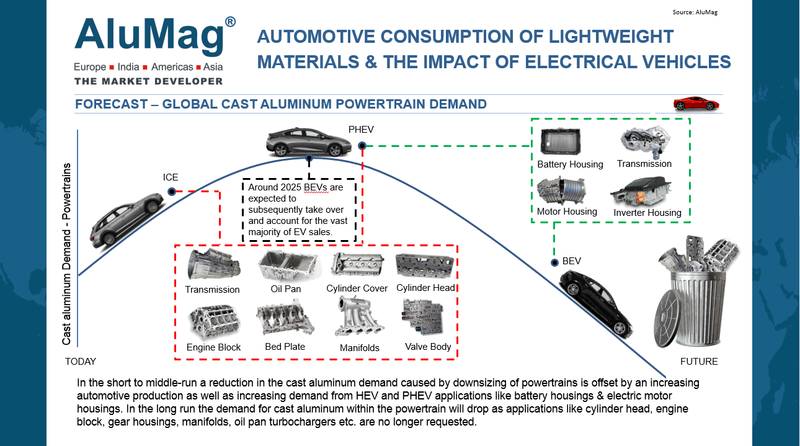 Should cast aluminium become the preferred solution to house the battery on BEVs, the difference in the cast aluminium utilization would be narrowed down considerably. At the moment though steel or hybrid solutions seems to be preferred by the OEMs. Furthermore heating, cooling, steering, brake or recuperation, assistance systems, door closers, windows, etc. are or will be electrified, which will decrease the demand for cast aluminum further. In addition to that cast aluminum is under pressure from other materials like for example, Aramid reinforced plastics that replace zinc and aluminum die casting in the small parts sector such as belt tensioners, filter housings or brackets, etc. For a state of overcapacity to occur it is important to note that the BEV share has to grow considerable faster than that of the PHEV and Full HEV combined. 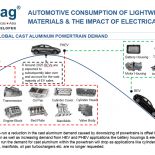 Otherwise the decreasing demand for cast aluminium created by the growing penetration of BEVs would be compensated by the increasing demand for PHEV and Full HEV applications. Furthermore some regions like Africa, Russia and parts of Asia are not likely to be hit due to the expected low penetration of BEVs. One may argue that the increasing use of cast aluminum for structural applications will more than offset a possible declining demand for powertrain applications. Structural cast aluminum applications are being used increasingly in the premium segments for applications such as suspension domes, longitudinal carriers, cross-members, doors / gates and A-B-C pillars. In Europe the demand for structural cast aluminum applications increased by around 65% in 2017. The high growth rate in this segment has not gone unnoticed resulting in several new entries in the last couple of years (Bocar, Cosma, Nemak, 2a, Mercury). Profiting from a growing segment but also diversifying its business away from ICE powertrain applications. But it is questionable if the increasing demand for structural cast aluminum applications will more than offset the dropping demand for cast aluminum applications expected due to the increasing penetration of BEV vehicles. So far there has only been few samples of structural cast aluminum applications in and below the D-segment. Furthermore hybrid body structures are increasingly being utilized by the premium OEMs instead of full aluminum bodies. Audis latest generation A8 D5 (body weight 621 pounds – 58% aluminum) was launched with a hybrid structure resulting in a heavier body compared to the outgoing A8 D4 (body weight of 509 pounds – 92% aluminum) aluminum structure. 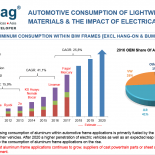 The increasing penetration of BEVs is/was expected to boost the demand for lightweight materials in structural application even further, but the fast developing battery technology has and could have a negative impact on OEMs willingness to implement these materials. When the BMW I3 was launched back in 2013 it made sense for BMW to invest in the CFRP cell for the I3 as a lighter car needs a smaller battery. The battery is the most expensive part on an electric car and the cost saved on the battery could be invested in the frame. In the meantime advances in electric vehicle battery technology have improved vehicle operating range by more than 50% since 2013, taking some pressure off the need to use ultra lightweight materials like carbon fiber in the manufacturing process. Though aluminum and CFRP can`t be compared projected advancements in battery technology could/will limit the use of structural cast aluminum applications too. Two-thirds of consumers consider 300 miles / 480 km range on a single charge as sufficient. [USB Study]. Next generation BEVs from VW, Nissan, Daimler and BMW are expected to have a range of up to 500-600 km. Solid-state batteries as announced by Toyota, BMW and VW will increase range even further and bring charging times down to “a few minutes”. If solid state batteries performs as projected by the OEMs, when they are launched around 2022, one of the main incentives to use lightweight materials “powertrain efficiency” no longer fully apply and demand for automotive aluminum applications could decrease as a result. Looking at newly launched BEVs like the Tesla Model 3, Chevrolet Bolt and Nissan Leaf all features a steel structure. The VW ID will, according to industry sources, become a steel structure with some components made out of aluminum and magnesium and the next generation BMW I3 is said to lose its carbon/ aluminum passenger cell/ drive module. In fact BMW and Benteler have de-invested from carbon engagement. The technical commercial conditions are in place. Add to that a potentially global economic downturn, and we could see a painful overcapacity in the aluminum foundry industry. Right now, we see over-heated markets and a consolidation is expected of the stock exchange, global economy, interest on capital, Chinese real estate, geo-political crisis and automotive.